So I'm in the middle of my mods. I've got the mags wired passive, kill switch all working fine. Still no piezo. I've wired in the Powerchip and the output jack that came with. I feel like I'm missing something about the connections at the jack. How is yours wired. I've tried several things, still no piezo. Help! I can't be of much help with that I am afraid. Check each wire I know this wiring works I have done it twice now. But I know what I drew if anything isn't clear I'll try to help. Some of the colored wires are correct and some are arbitrary which I guess wasn't the best way of drawing this. Do you have a wiring chart for the jack? You can down load one from Fishman. Yeah, I've tried it the way it's drawn above. Not sure why it's not working... I've got the wiring diagram for the jack, so must be something else. I'll try again, see if I can find the issue. So, I've checked some things out. I've found that I've got continuity between the "hot" plate and the ground pad on the bridge itself. In other words, the ground pad and the pad where the piezo leads attach on the bottom of the bridge are connected, somehow, though they don't appear to be (no obvious connection exists). I'm fairly sure this should not be the case, and can't see why this is happening. Problem solved. You see in the pic above, one of the piezo's has a red lead? Guess what? That one was causing all the problems. I replaced that one with one of the old ones (I had replaced them all with new style, because one had broken). I didn't think anything of it when one of the six new ones had a different color lead. I replaced it with one of the old style and it works. Now the problem is the old style saddles are taller than the new ones, considerably so. I'll call Parker service and get another so they match up. 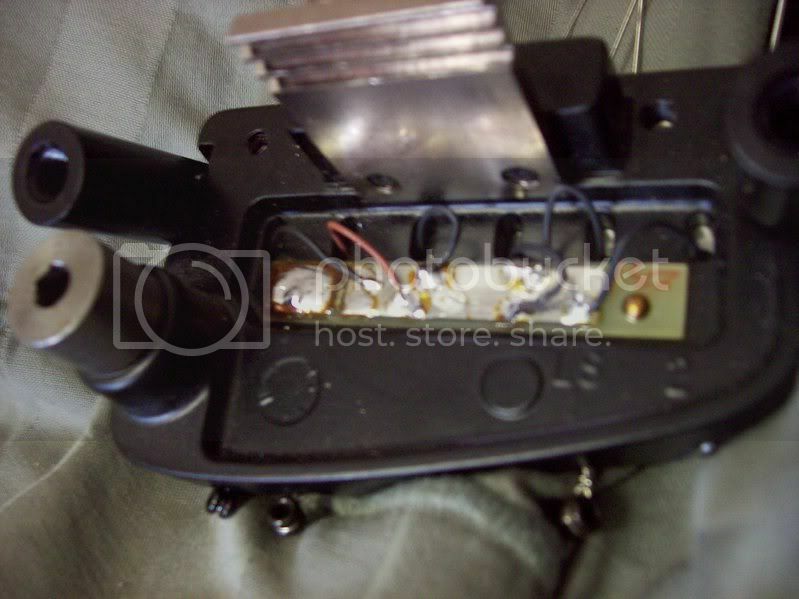 This also means that the original problem probably wasn't the ribbon wire, but this bad piezo element. So I may not have needed the PTP conversion. But now that it's done, I'm happy. Plus I've got the kill switch to play with, the master vol is out of the way (Always had to dance around that), and I've got some cool PU's. I thought I was losing my mind. Whew!!! PS Alex, I think the mag vol in the original diagram is backwards. Check and see if I'm not just being dyslexic. You're right the wiring is back wards. In the guitar the pot is at the top with the connection hanging down and then the terminals are on the left is correct but I turned the pot around so it is wrong. I'll fix the drawing and correct the link. Glad to be of help weird about that one saddle, that's a real head scratcher that is. The above drawing is the corrected version. Something finally clicked in my mind, and I started questioning some assumptions concerning the piezo. I decided to check the continuity between the piezo "plate" where the 6 leads attach and the ground pad right next to it (bottom of the bridge, pictured above). Should be none, was fully connected. Visually didn't make sense. The red one just stuck out to me, so I detached it, checked, and violla... no continuity. Customer service has one on the way to replace it. I was a hair's breadth from sending back the Powerchip, for testing. I'm so glad it didn't come to that! 1. would you please explain why this won't work in mono? I have noted that Ryan's Blend (Balance) pot mod will work in mono. 2. the piezo output on my chip is opposite that on your wiring diagram. I had to ground the red wire (upper wire in your diagram) and use the white wire (grounded in your diagram) for the piezo output to the jack. The red wire carried no piezo signal. 3. I did end up reversing the polarity of the piezo to get the same "summed" output as before the mod. Note that I am using a single amp for both outputs and this is probably a non-issue if using separate amps. Thanks for making the drawing; I find it extremely helpful. OK version two. The Fishman Powerchip has issues switching it simply doesn't always work. There are two solutions one use some device between your guitar and amp to fool the switch into switching or run the piezo preamp in mono mode piezo only. This is the wiring for that. This will work for any 2nd generation or converted Fly. In the both positions of the mag/piezo switch the signal remains divided right to the jack if you introduced a blend or second switch at that point you might be able to feed both signals together into the tip of the chord. You could also run a stereo chord into a blend box and mono chord from there to the amp. This is all hypothetical because I haven't tried it. The reason I went this way in the first place was because the Powerchip failed to switch to stereo/mono when I ran two amps and Fishman told me they had no solution except to permanently bypass the auto sensing switch in the Powerchip. OK, I got that. So the mixer is blending the signals so both go to the tip when it senses a mono cord is being used. So what I/we need is a schematic of the mixer itself. Then I could see how the mixer is processing the signals and perhaps find a way to mimic that passively. Anyone got a schemo of the mixer circuit? I have tried the A/B switch and it does sum the signals and allow a mono output, with the mag pups bypassing the mixer circuit. In fact, with my Mojo, the signal levels are more balanced than when both were going through the mixer. Ah, but wait! Couldn't the switch in the Fly be made to do the same thing the A/B box does? Why not make the switch post-mixer instead of pre-mixer? Good question I don't have an answer. In the old guitars they had a button that told the guitar whether you were running a stereo or mono chord. With the switch you could switch to the mono setting with a stereo cord and and play the piezos through the Mag amp. With the auto sensing switch you couldn't do that. Another reason the old guitars were better for some people. thanks Alex. yes, the part about the switch makes sense. In mono everything goes to the tip no matter what cable is being used. Well, the whole point for me is not to have to rely on the battery. Might be moot if my new batt continues to work for more than 2 or 3 weeks. I usually play several hours a day, so at the stated batt life of 200 hrs, I should be getting 60 to 70 days. I am going to take a closer look at the switch/mixer interface, just for fun. I have enough things on the ground to push and prod and would like to have as much as possible controlled on the guitar.